Muti-channel audio mixer circuit based on LM3900 IC. Four channels. 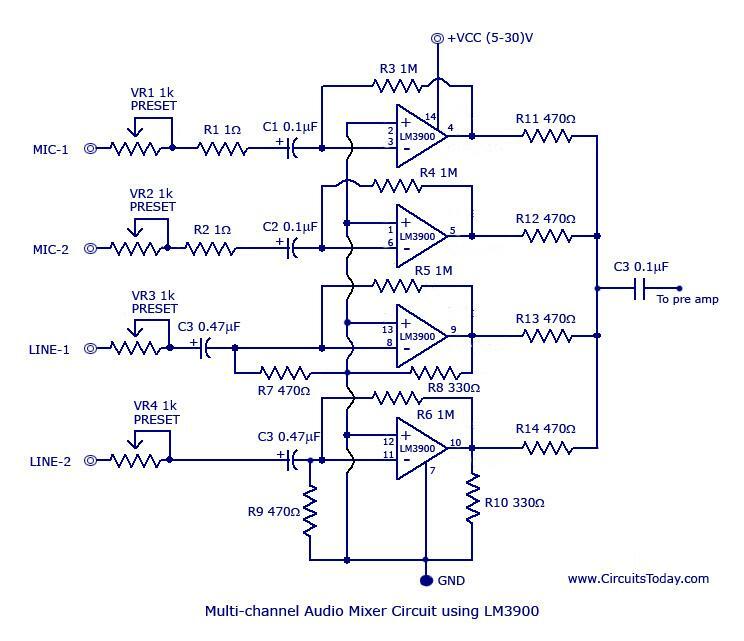 A simple multi-channel audio mixer circuit using LM3900 quad amplifier is given below. The circuit consists of 4 channel quad amplifier (LM3900). Two mic audio inputs and two direct line inputs are available in this circuit. By adding the same circuit parallel with this, you can increase the number of inputs according to the applications. Each input is connected to the inverting terminal of LM3900.The built in amplifier of each section amplifies every audio input separately and is fed to the output terminals. The output terminal from each channel is connected to a single output line with a resistance not greater than 680K and produces a mixed audio at the output with very low noise. This audio mixer circuit doesnâ€™t use a low impedance input to mix idealÂ sources. Capacitors C1 to C4 are the decoupling capacitors for the corresponding channels. C5 is the output decoupling capacitor. LM3900 series amplifiers consist of four independent and internally compensated amplifiers that are designed for single and wide power supply voltage. These amplifiers provide a wide range of voltage inputs and very good response for all audio frequencies. They also provide a large output swing. 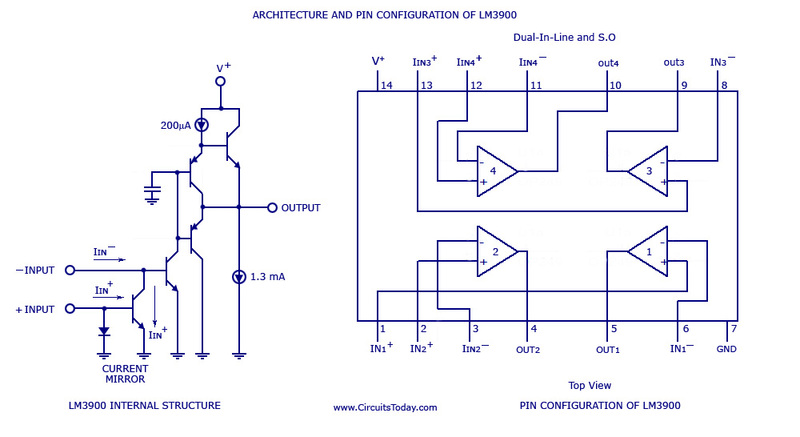 The architecture and pin configuration of LM3900 is shown in the picture below. The main features of this audio mixer circuit as compared to the other audio mixers are given below. The circuit can be powered from anything between 5 to 30V DC. The power supply must be well regulated and free from any sort of noise. LM3900 must be mounted Â on a holder. VR1 to VR4 can be used for adjusting the volume level of the corresponding channels. All fixed resistors are 1/4 watt carbon film type. If the power supply circuit is far from the mixer circuit, then a 100uF/50V electrolytic capacitor must be connected from the positive supply rail to the ground. I think resistors R8 and R10 should be taken out.